This trail leads to a high, panoramic view of Lake Michigan half a mile from the trailhead. One of the best views of the waters of the Manitou Passage and the Manitou Islands which lie five miles offshore. For a quick jaunt, head back the way you came. For a longer hike with some extended uphill heart-pumpers, turn east from the dune overlook for a winding walk through some meadows and hardwood forests. Trailhead: Take M-22 to Port Oneida Road (6K [3.7 mi.] north of Glen Arbor). Follow Port Oneida Road until it ends at Basch Road. Follow Basch Road east to trailhead. 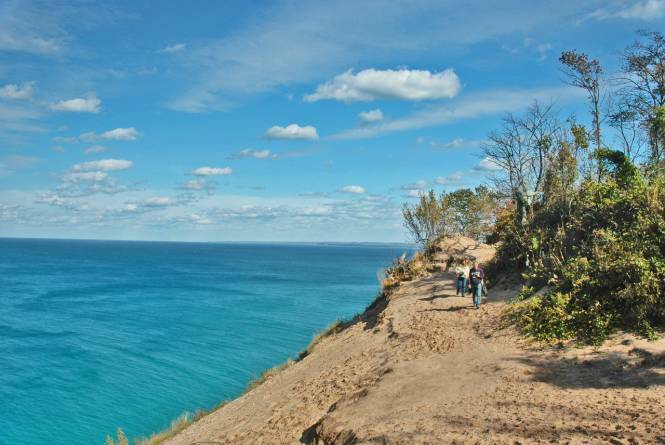 The National Lakeshore charges a visitor fee of $20 per vehicle for a seven day pass or $40 for an annual pass. Mountain bikes are not allowed on any of the National Park trails. Pets must be kept on a 6-foot maximum leash.